Ralph Chester Smith was born in 1901. He married Theo Judd, daughter of William Curtis Judd and Alice Lee Corey, on 22 October 1922 at first marriage for her, Kansas City, Jackson, Missouri. Ralph Chester Smith died in 1954. Married Name circa 1909 As of circa 1909,her married name was Judd. Lulu Justice was born on 20 August 1888 at Myrtle, Oregon, Missouri. She married William Curtis Judd, son of Marquis Lafyette Judd and Mary Louvisa Smith, circa 1909 at 2nd marriage for him; 1st for her. Lulu Justice died on 5 December 1958 at Joplin, Jasper, Missouri, at age 70. Theodore Irwin married Theo Judd, daughter of William Curtis Judd and Alice Lee Corey, after 1923 at 2nd marriage for her. Name Variation Alice Lee Corey was also known as Lee. Name Variation Alice Lee Corey was also known as Lena Alice. Name Variation Alice Lee Corey was also known as Allie L.
Married Name 28 November 1897 As of 28 November 1897,her married name was Judd. Married Name 1 June 1908 As of 1 June 1908,her married name was Hill. Married Name 1925 As of 1925,her married name was Hudson. Alice Lee Corey was born on 11 July 1880 at Kansas. She married William Curtis Judd, son of Marquis Lafyette Judd and Mary Louvisa Smith, on 28 November 1897 at Cleveland, Cass, Missouri. Alice Lee Corey and William Curtis Judd were divorced before 1908. 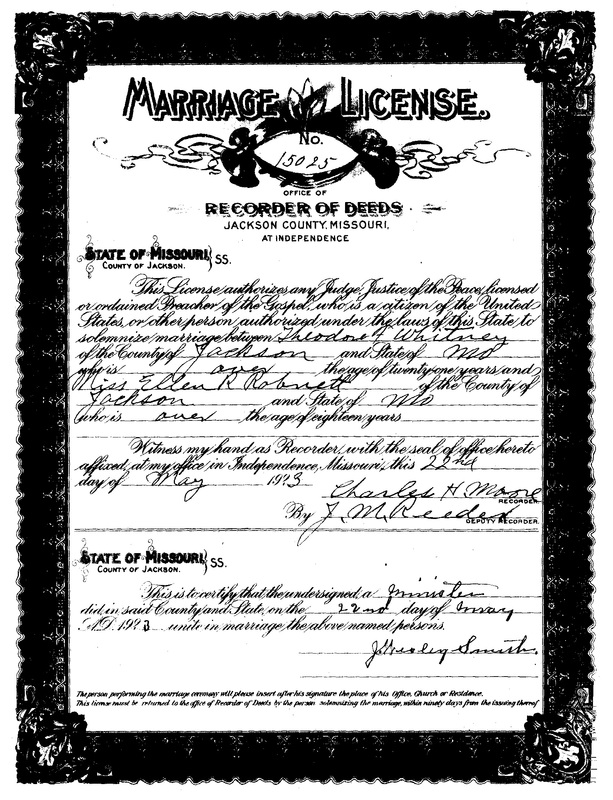 Alice Lee Corey married Nathan Aron Hill on 1 June 1908 at Harrisonville, Cass, Missouri. Alice Lee Corey married Richard L. Hudson in 1925. Alice Lee Corey died on 16 December 1946 at Lincoln, Missouri, at age 66. Alice Lee Corey had 1 with 1 living in 1900 children. [S245] U.S. Federal Census 1900 U.S. Federal Census, by Ancestry.com, Year: 1900; Census Place: Shelbrook, Greenwood, Kansas; Page: 13; Enumeration District: 0053; FHL microfilm: 1240481. [S243] U.S. Federal Census 1920 U.S. Federal Census, by Ancestry.com, Year: 1920; Census Place: Omaha Ward 10, Douglas, Nebraska; Roll: T625_990; Page: 3A; Enumeration District: 113. Name Variation Nathan Aron Hill was also known as N. A.
Nathan Aron Hill was born on 18 October 1874 at Virginia. He married Alice Lee Corey on 1 June 1908 at Harrisonville, Cass, Missouri. Nathan Aron Hill died on 8 February 1920 at Omaha, Douglas, Nebraska, at age 45. On 12 September 1918 at World War I Draft Registration, Omaha, Douglas, Nebraska. Richard L. Hudson was born in 1870. He married Alice Lee Corey in 1925. Richard L. Hudson died in 1952. George E Horton was born on 17 May 1873. He married Sarah May Smith, daughter of Jacob Shoemaker Smith and Angeline Cordelia Judd, on 20 February 1896. George E Horton died on 22 June 1944 at Tulsa, Oklahoma, at age 71 George E Horton obituary. Harry Economopoulos was born on 24 July 1924. He married Evelyn Jean Anderson after 1948. Harry Economopoulos died on 1 September 1992 at age 68. (?) Asselin married Debra Crotchett, daughter of Earle Crotchett and Evelyn Jean Anderson. Fred Hutchinson was the son of Rebecca Frances Glass. 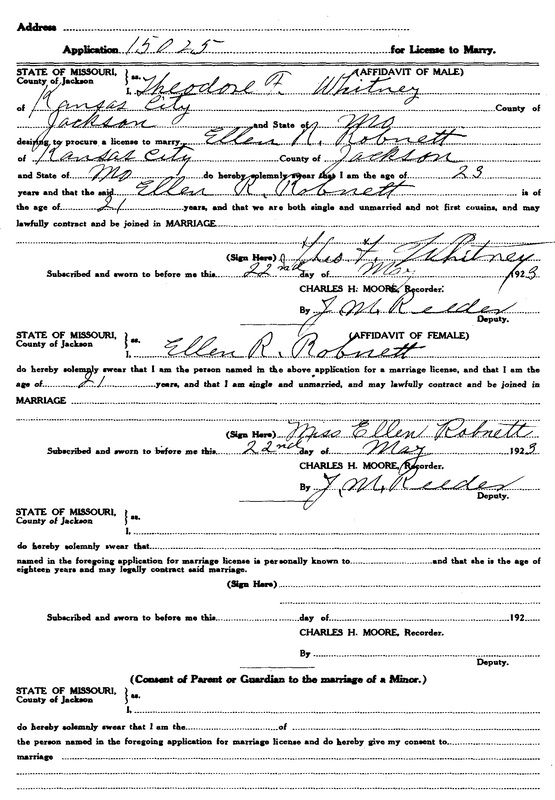 Fred Hutchinson was listed as a beneficiary in Greenberry Glass's will on 8 April 1897 at Pope, Illinois; Will of Greenberry Glass. Bessie Hutchinson was the daughter of Rebecca Frances Glass. 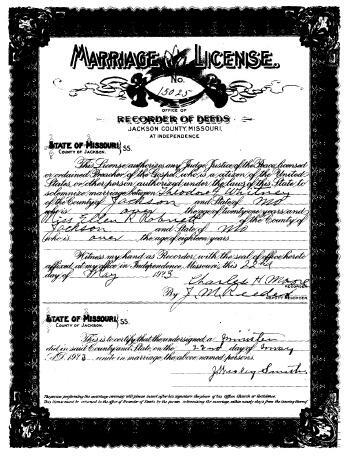 Bessie Hutchinson was listed as a beneficiary in Greenberry Glass's will on 8 April 1897 at Pope, Illinois; Will of Greenberry Glass. Daniel Smiley was born on 10 March 1849 at Princeton, Caldwell, Kentucky. He married Mary Jane Glass, daughter of Greenberry Glass and Rebecca Nichols, on 1 December 1870 at Princeton, Caldwell, Kentucky. Daniel Smiley died on 10 January 1935 at Pope, Illinois, at age 85. Harry Robnett was born on 18 January 1893 at Illinois. He died on 19 January 1893 at Illinois. He was the son of James Edward Robnett and Louisa Mary Harrison. Harry Robnett was buried after 19 January 1893 at Antioch Cemetery, Rosebud, Pope, Illinois. Francis Graham married Rebecca Swartz. Married Name Her married name was Graham. Rebecca Swartz married Francis Graham. George Uhl married Lillian Hermina Steinhauer. Married Name Her married name was Uhl. Name Variation Lillian Hermina Steinhauer was also known as Minnie. Lillian Hermina Steinhauer married George Uhl. Lillian Hermina Steinhauer died after 1956. Name Variation Theodore F. Whitney was also known as Theo F.
Theodore F. Whitney was born circa 1900. 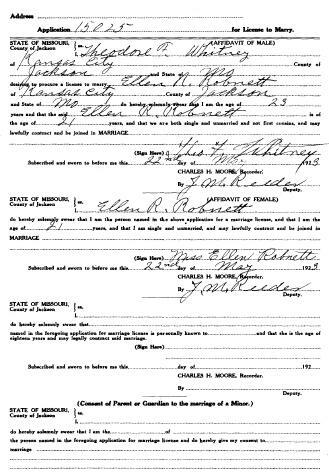 He married Ellen Ruby Robnett, daughter of Augustus Greely Robnett and Ada Graham, on 22 May 1923 at first marriage for her, Kansas City, Jackson, Missouri. (?) Lockwood married Marguerite Luetta Carey, daughter of John Carey and Marietta Combs. (?) McLean married Chlotilda Veronica Carey, daughter of John Carey and Marietta Combs. (?) Sain married Mable Florina Carey, daughter of John Carey and Marietta Combs. John Stansberry was the son of Nate Stansberry and Marietta Combs. Clarence Stansberry was the son of Nate Stansberry and Marietta Combs. Fred Duckett married Mame Teel, daughter of David Wilson Teel Jr. and Sarah Elma McCormick. Fred Duckett died before 1971. John Ernest Teel was born on 31 December 1871. He was the son of David Wilson Teel Jr. and Sarah Elma McCormick. John Ernest Teel died after June 1971. Floyd Sweeney married Erma Jane Combs, daughter of Denton Day Combs and Pearl Simmons, before 1993. Stillborn son Combs died on 26 November 1922 at Phoenix, Maricopa, Arizona. He was born on 26 November 1922 at Phoenix, Maricopa, Arizona. He was the son of Denton Day Combs and Pearl Simmons. Patience A. Crotchett was born in February 1836 at Pope, Illinois. She was the daughter of John Isaac Crotchett and Charity Dyer. Patience A. Crotchett died on 25 August 1836 at Pope, Illinois. She was buried after 25 August 1836 at Bradford Cemetery, Pope, Illinois. James E. Minor married Emily O. Crotchett, daughter of John Isaac Crotchett and Mary Ann Davidson, before October 1863. Daniel Singer Sr. was born on 22 December 1796 at Virginia. He married Mary Ward Crittenden, daughter of Richard Hazelwood Crittenden Sr. and Sally Tanner, in 1817. Daniel Singer Sr. died on 14 July 1858 at Bartholomew, Indiana, at age 61.